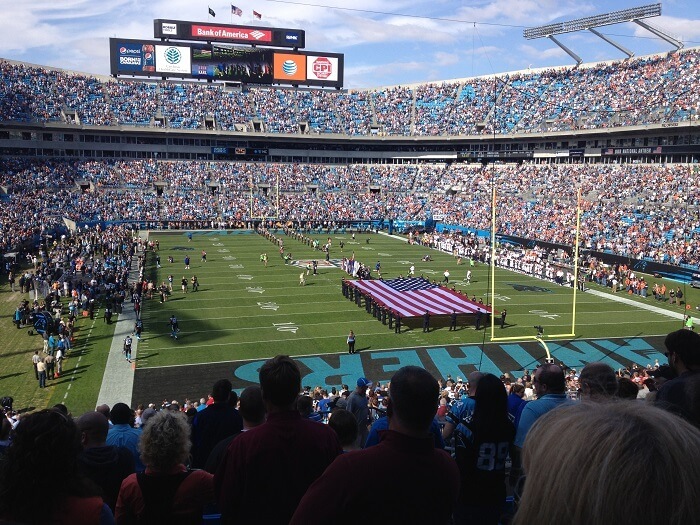 Bank of America Stadium (formerly known as Carolinas Stadium and Ericsson Stadium) is a 74,455-seat football stadium located on 33 acres (13 ha) of land in uptown Charlotte, North Carolina, USA. It is the home facility of the Carolina Panthers NFL franchise. The largest crowd to ever attend a football game at the stadium was November 18, 2013 when a crowd of 74,225 watched the Panthers defeat the New England Patriots 24-20 during a nationally televised Monday Night Football game.